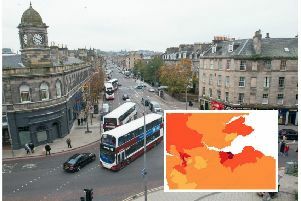 A boy has died in hospital after collapsing at a bus stop in Edinburgh. Shoppers and nearby residents described the battle by paramedics to try to save him by giving him CPR. The boy, thought to be around seven years old, was taken ill at a bus stop on Constitution Street on Saturday evening. Emergency services were called at about 5:36pm and two ambulances attended the scene where they attempted to resuscitate the child before taking him to hospital. Police were in attendance just minutes later. He was treated at the Royal Hospital for Sick Children but died later that evening. The reason for the sudden illness is not known but the death is not thought to be suspicious. Constitution Street was cordoned off for three hours after the incident from Laurie Street to Coatfield Lane with a police officer on duty to redirect traffic. The bus stop was taped off until around 9pm when police removed the cordon. It is believed that the boy and his family had been heading home from a nearby soft play centre around the corner on Easter Road. Officers went to bars in the immediate vicinity to request CCTV footage as part of their inquiries. The family have requested privacy to let them grieve after their loss. A Police Scotland spokesperson said: “Police in Edinburgh were in attendance at Constitution Street around 5:40pm on Saturday 7 April after a child was taken unwell. “The boy was taken to the Sick Kids Hospital where he sadly died a short time later. “There are not thought to be any suspicious circumstances.